The fifth of the series of trains. 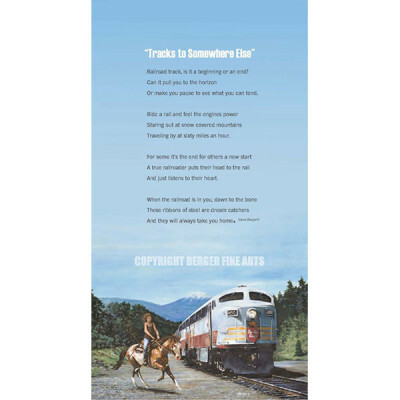 This one features a race between a Canadian Pacific engine coming up a long grade and a young woman on a spirited horse. The question is does she intend to dart across the tracks ahead of the engine or come along side the engine and show the engineer how fast a horse she has. This 12" x 24" archival quality Giclee print is signed and ready to frame.